Ivan Brunetti’s comic strip in the March 7 issue of The New Yorker illustrates the frustrations of an art teacher who, from the students’ perspective, teaches too much. It ends badly: a student asks if computers can be used on the homework assignment, and the teacher, exiting the class, mutters to himself, “I’m wasting my life.” It’s not a funny comic, exactly, but this is The New Yorker, and while Brunetti does admit to using computers in his own work, they only aid in the production stages, not the creative. With computers, “there is no discovery, only micro-managing,” writes Brunetti in his new book, “Cartooning: Philosophy and Practice.” The how-to cartoon manual, structured like his fifteen-week course of the same title at Columbia College, is full of Brunetti’s brand of self-effacing, wry perspectives on life and art, and it’s also a complete starter’s guide to creating comics—not just the slapstick and pulp fantasies of the Sunday funnies, but the diaristic, bittersweet realisms of contemporary life, a genre populated by Charles Schulz, Chris Ware, and Brunetti, of course. Like David Hockney, who makes one drawing a day on his iPad—one of which is featured on that same The New Yorker’s cover (ah, irony)—Brunetti expounds the importance of keeping a daily drawing practice. There is no substitution, and no excuse, for not working daily on one’s craft. “Unfortunately, you will probably have to draw 100 bad pages before you draw a good one; there are no shortcuts,” he writes in “Cartooning.” Persistence will lead to consistency, which will lead to an individual style. Developing this craft is one of Brunetti’s main lessons in his cartooning manual. There are many how-to books on cartooning, notably Scott McCloud’s widely read “Understanding Comics,” from 1993. 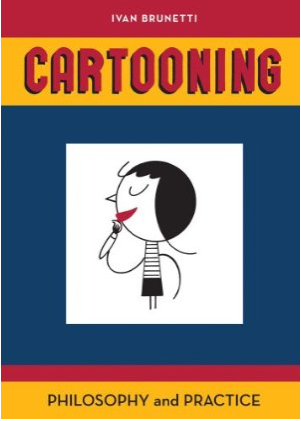 Where McCloud is strong on the theoretical analysis of cartooning, Brunetti implores students to get a grip on the creative process by actually doing it. He provides a syllabus, weekly exercises and homework assignments, and useful advice on which brushes to use, how to thicken cheap, watery ink, and the type of paper that cartoonists find most handy. Following that, Brunetti urges productive doodling. Storytelling, comedy and style come only through hard work, including trial and error, and Brunetti’s course slowly builds to balance composition and narrative. It’s a funny thing that, when engaged in activities like writing fiction or life drawing from models, one begins to re-see the everyday as material for a story, or strangers’ faces as fodder for a drawing. Brunetti’s “Cartooning” is also like that. Boxes and grids start to capture life, and make it lifelike. I am not a cartoonist, nor an aspiring cartoonist, but I found several chapters in “Cartooning” applicable to anyone who lives a creative life. The book’s introduction and its final chapters provide little gifts of inspiration. Brunetti monologues on love and relationships, dictatorships, the creative process, communication, self-awareness and food—complete with a recipe. Perhaps because Brunetti is a cartoonist, he is able to distill what he knows with ease. He is aphoristic: “Art is somewhat like spit. It does not repulse or even worry us while it is still inside of us, but once it exits our body, it becomes disgusting.” And so, the rest of the book is focused on how to spit-shine one’s creative expressions.